Yesterday, the Core Team met up with our friend Frank and his own growing posse for some hawkwatch excitement. We convened at the Quaker Ridge Hawk Watch at the Audubon Center in Greenwich, Connecticut. The Audubon Center in Greenwich is sensational, a wild space as well managed (and richly endowed) as one could want. As inviting as its deep woods, groomed trails, and inspired environmental education center are, the crown jewel of this sanctuary is most definitely Quaker Ridge. This hilltop offers the area’s most strategic sightlines for taking in the autumnal migration of thousands of raptors southward. Consequently, hawkwatch feels like something of a holiday at Quaker Ridge, an annual celebration of the passage of predatory birds. Such a special season warrants a festival and it should come as no surprise that the folks at Connecticut Audubon make a full weekend of it, which coincidentally happened to be this weekend. Our timing was auspicious indeed, not just because we visited during the Hawk Watch Weekend Festival, but because we arrived on an absolutely stunner of a late summer day. We’ve had a bit of bad weather for the last week, which pent up bird watchers, if not the birds themselves. Yesterday, everybody was out in force. All the expected birds were on the scene, from House Sparrows, House Finches, and starlings to the standard doves, titmice, chickadees, cardinals, and mockingbirds. I observed far fewer songbirds than anticipated, but among the American Goldfinches and Blue Jays, I did spot a Red-eyed Vireo and Savannah Sparrow. But while my eyes were fixed on foliage, everyone else was scanning the skies. Part of the fun of a hawkwatch is that one never knows what amazing accipiter or bodacious buteo might happen to wing by. Still, if you have a target species in mind, it’s important to play the odds. Mid-September in the Northeast U.S. represents the early stage of raptor migration and the bird I wanted to see, the Broad-winged Hawk, is a notoriously early migrant. Broad-wings are among the most popular of the predatory pilgrims because of their propensity to travel in great flocks, called kettles. Though I’ve seen single specimens before, I’ve never spotted kettles of broad-wings before, until this weekend. At Quaker Ridge, the distant skies showed swirling masses of ten, twenty, or more birds at a time, pure hawkwatch gold! Broad-winged Hawks may have been the stars of the show, but other actors had memorable roles as well. Among the raptors counted during the hours we watched were Red-tailed Hawk, Sharp-shinned Hawk, American Kestrel, Northern Harrier, Turkey Vulture, and a lone immature Bald Eagle. It should be mentioned that many of these birds were merely distant, indistinct blurs to most observers. Yet, to those dedicated individuals who spend eleven months a year poring endlessly over ornithology texts and raptor silhouettes, their identities were glaringly obvious. I’m so happy we had an army of that particular breed of birder on hand. I’d love to tell you that the Harris’ Hawk pictured above burst from the cover of a broad-wing kettle to pose graciously for a portrait, but you’re too smart for that. You know, of course, that this hawk is hardly ever noted much further north of than southern states like California, Texas, or Louisiana. 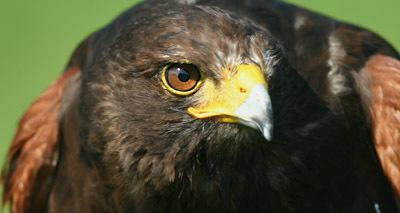 Were a Harris’ Hawk to make a legitimate appearance at a Connecticut hawkwatch, Rare Bird Alerts for the entire eastern seaboard would be abuzz. 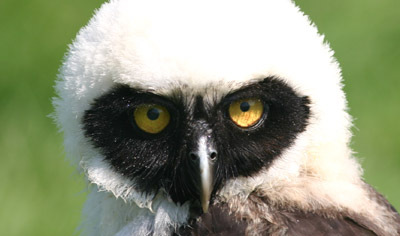 And were a South American specialty like the young Spectacled Owl below to turn up in the wilds of Greenwich, birders would be flying in from the entire ABA area faster than you could say, “mega-rarity.” But the avians in the photos are not aberrations, just entertainment. Even my limited experience of hawkwatches has taught me that rehabbed raptors are a staple of such gatherings. Though I’m far more partial to birds unfettered and in their natural environs, I can appreciate the important role these ambassador avians play. And when else am I going to see a Prairie Falcon and a Great Horned Owl side by side?